US Sailing's 2013 Rolex Yachtsman and Yachtswoman of the Year Award Ceremony Watch Brian Porter and Jody Starck take the stage at St. Francis Yacht Club to formally accept US Sailing's 2013 Rolex Yachtsman and Yachtswoman of the Year Awards in San Francisco on February 25, 2014. Groupama sailing team and Team Aberdeen Singapore crash video above - The penultimate days racing in Singapore delivered possibly one of the most dramatic moments in the eight-year history of Extreme Sailing Series™. In winds that were varying from 5 to 23 knots across the racecourse, Team Aberdeen Singapore caught one of the biggest gusts of the day as they came into the finish line struggling to hold off the pace and ploughing into the back of France's Groupama sailing team. For the 2014 Extreme Sailing Series The Wave, Muscat set out their stall with a second overall place at Singapore having staged a solid and impressive comeback over the four days while Oman Air are already looking ahead to Act two in Muscat next month. From Thursday 17 April - Sunday 20 April, the starters will vie for the pinnacle of IRC handicap racing in Australia and the chance to win a brand new North Sails spinnaker emblazoned with '2014 Audi IRC Australian Champion' for divisional winners. The new regulations received much attention from cruising sailors and international organizations, associations and unions active in the maritime tourism domain informed their members about the new increased taxation Greece has imposed on yachts. Extreme Sailing Series™ Act 1 Singapore Video Highlights above - The bustling and vibrant Asian garden city of Singapore was the Host Venue for the opening Act of the 2014 Extreme Sailing Series™, providing the ultimate venue for Stadium Racing, with the support of Host Venue Partner, Aberdeen Asset Management. 12 elite level teams with 60 of the world's best sailors battled it out on Marina Bay, and the event more than lived up to all the pre-season hype and expectation. The Singapore wind played its tricks with the teams, with huge gusts blowing across the bay like a bullet, delivering one of the most action-packed Acts in the eight-year history of the elite level Stadium Racing circuit. Extreme Sailing Series results and standings here. Resounding victory for Alinghi after an action-packed week on the Singapore Stadium Racecourse » Extreme Sailing Series: "Down to the wire for second and third place – with a penalty in the final race for Emirates Team New Zealand throwing away their chances of a podium finish. - Three returning teams from 2013 take race honours – Alinghi, The Wave, Muscat and Realstone – despite Realstone missing the penultimate days racing." Nick Rogers has been a champion helmsman in many one-design sailing classes, from Mirror dinghies to International Dragon keelboats. Today he won another championship, the State title in the SB20 sports boat class, on Hobart's River Derwent. Inter-Collegiate Sailing Worlds- J/80s France! As the U.S. collegiate racing season approaches its spring national championships this year, two of its prominent schools - Tufts and Georgetown - will be sending teams to the 2014 EDHEC Sailing Cup on April 25 to May 3 in Les Sables d'Olonne, France. (sailing video above) Extreme Sailing Series results and standings here. Shuffling the pack ahead of the penultimate days racing at the Extreme Sailing Series™ in Singapore » Extreme Sailing Series: "Alinghi stamp their dominance, taking the lead after two days on the Marina Bay Stadium – despite narrowly avoiding a capsize! - The fleet battle a huge wind range with gusts up to 24 knots funneling through the surrounding skyscrapers and across the race track. - A night in the pitlane for Realstone and Oman Air after a huge collision leaves both boats bruised. - Groupama sailing team win the Aberdeen Challenge Trophy...."
The 30-year-old Willis, who won the 470 World Championships in 2006 and 2008 with former helm Nic Asher, had been sailing with two-time Olympic silver medallist Nick Rogers during the 2013 season up until the World Championships in August. Extreme Sailing Series 2014 in Singapore. This is not a rehearsal. British team at the America's Cup: smooth sailing? LIVE Singapore: Day Two - Extreme Sailing Series™ 2014 - Scheduled for Feb 21, 2014 (sailing video above) Extreme Sailing Series results and standings here. Realstone throw down the gauntlet on Extreme Sailing Series™ 2014 opening day » Extreme Sailing Series: "The first eight races of the 2014 season complete – with up to 250 more planned this year. - GAC Pindar finish the day bruised – but not out – with a night of repairs in the pitlane ahead....."
Sailing-Ainslie sets British course for America's Cup | Reuters: "Sailing legend Ben Ainslie has his sights on a British victory at the next America's Cup but is keeping his skills sharp and putting some new crew members to the test at the start of this year's Extreme Sailing Series in Singapore. A four-time Olympic gold medalist and an America's Cup winner last year with Oracle Team USA, Ainslie told Reuters on Thursday that the tight circuits of "stadium racing" present tough challenges for sailors of the high-speed catamarans...."
Scuttlebutt Sailing News: "The 2014 Extreme Sailing Series will celebrate its eighth year on the international sailing calendar, with twelve elite teams putting it on the line this week as the circuit gets underway in Singapore. The season has gotten extra attention this year, as with details still getting sorted out for the 35th America’s Cup, several aspiring challengers are directing their training to the Extreme 40 racing. Among the field in Singapore are… Emirates Team New Zealand (NZL) – Skipper/Helm: Dean Barker (NZL) GAC Pindar (AUS) – Skipper/Helm: Seve Jarvin (AUS) Groupama Team France (FRA) – Skipper/Helm: Franck Cammas (FRA) J.P. Morgan BAR (GBR) – Skipper/Helm: Ben Ainslie (GBR) . . ."
Oracle America's Cup team to train on Sydney Harbour | The Australian: "AUSTRALIANS will get a taste of the spectacular America's Cup sailing competition next month as reigning champions Oracle Team USA train with newly formed Team Australia on Sydney Harbour. And there's a slim chance the city could even end up hosting the next America's Cup - with the current venue for 35th edition of the Auld Mug still very much up in the air." Fairhaven crew aids in Coast Guard rescue of storm-battered sailboat | Local News | The Bellingham Herald: "... At about 6:30 p.m., the crew of the Fairhaven-based Coast Guard Cutter Terrapin heard a distress call from a sailboat that was taking on water about 5 miles from shore. The 34-foot sailboat's sails wouldn't come down, and the boat was being battered by waves up to 5 feet high and 40 mph winds. A father and his two young sons were on board, as well as two other men, and the boat wasn't going to make it to shore. Cann and Petty Officer 2nd Class Cameron Ostman got into an inflatable Zodiac and headed out to the sailboat. When it was clear that conditions were too poor to tow the boat to shore, the Coast Guard decided to get the people off the boat before the waves took it down...."
The anticipation that has been building around the first Act of the 2014 Extreme Sailing Series™ - dubbed by many sailing fans and the media as the sailing series to watch this season -- will come to a head as the first starting gun is fired, starting four days of Stadium Racing on Singapore's world-famous Marina Bay, 20th-23rd February. In 2014, the pioneering Stadium Racing circuit will once again be supported by Series Main Partner Land Rover, as it continues to deliver high-octane Stadium Racing at eight iconic locations around the world. Watch the promo video, as the ultimate city-centre stadium, Singapore, prepares to welcome 12 Extreme 40s and 60 elite level sailors. - The teams look ahead to the forthcoming season: “This is most definitely the circuit with the highest level of competition in the world this year,” says Groupama Team France skipper, Franck Cammas. Extreme Sailing Series: Like Formula One on water? EFG Sailing Arabia – The Tour 2014 overall series leader, Sidney Gavignet and team on EFG Bank (Monaco), won Leg four, from Dubai to Ras Al Khaimah yesterday, despite being one of two teams over the line at the start. 2014 Sperry Top-Sider St. Petersburg NOOD Regatta on Yacht Scoring - A complete web based regatta administration and yacht scoring program: "2014 Sperry Top-Sider St. Petersburg NOOD Regatta Final Cumulative Results"
Patience in St. Pete | Sailing World: ".... By the top of the beat, we’d caught up to second place and held that position to the end. Even though our race was looking ugly, it paid off to stick to our guns and stay in phase, looking upwind for the next shift." San Diego makes push for America's Cup - San Jose Mercury News: "America's Cup officials are talking with other venues about hosting the 35th America's Cup because San Francisco officials haven't offered the same terms they did for last summer's regatta, which ended with Oracle Team USA staging one of the greatest comebacks in sports history. Last week, port commissioners voted unanimously to submit a bid to host the America's Cup on San Diego Bay in August 2017...."
Annapolis Yacht Club receives Captain Joe Prosser Award - Baltimore Sun: "The Annapolis Yacht Club was presented with the Captain Joe Prosser Award at the US Sailing Leadership Forum earlier this month in San Diego. The Prosser Award was created in recognition of the Merchant Marine Academy's first sailing master, Captain C.A. "Joe" Prosser, USMS, and is awarded each year to an organization that, in the opinion of the U.S. Training Committee, has made an exemplary contribution toward "improving the quality and safety in the training or instruction of sailors." Additionally, nominees must embody all characteristics of sportsmanship: honor, integrity, and a selfless dedication to the sport...."
Sailing: Midwinter Regatta Underway - Long Beach Grunion Gazette Newspapers: Breaking News, Sports, Business, Entertainment & Long Beach News : Gazettes.com - Sports: "Local residents Henry Sprague and Howie Hamlin are leading two of the eight classes competing in Alamitos Bay Yacht Club's share of the Southern California Yachting Association's 85thMidwinter Regatta, which opened as one for the ages Saturday. Sprague, 68, tops the singlehanded Finn class with finishes of 1-6-1-1; Hamlin, approaching his 61st birthday next week, leads the 5-0-5s at 2-1-1-2...."
Calls to investigate Carmel Brookes' disappearance from yacht: " . . . .When she vanished off the deck of the yacht in mysterious circumstances in 2012, the main beneficiary of her $1 million plus nest-egg was the last person to see her alive - Goeden.. . ."
Miami boat shows - Sun Sentinel: "The boat show is at the Miami Beach Convention Center and has boats in the water at Sea Isle Marina & Yachting Center in Miami. Sailboats and sailing accessories are at Strictly Sail Miami at Miamarina at Bayside. The Y&B Show has more than 500 new and used boats in the Indian Creek Waterway along Collins Avenue in Miami Beach. The show opens at 10 a.m. each day and admission is free...."
One-Design course returns to BVI Spring Regatta >> Scuttlebutt Sailing News: "The BVI Spring Regatta’s One-Design race area will have its own course for the 2014 regatta March 31- April 6. The one-design course joins the two race areas out on the water; one for cruising/bare boats and the SOL course for racing. Having a race area specifically for one-design boats sets them apart and gives them their own space and races. 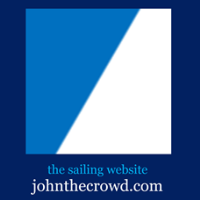 The area was started for the IC24′s, (converted J24) and now will include the fast growing J70 fleet." Hawaii, Newport, San Diego compete to host 2017 America's Cup | Reuters: "Hawaii and the coastal cities of Newport, Rhode Island, and San Diego are vying to entice billionaire Larry Ellison to let them host the America's Cup in 2017, when the contest for the historic sailing trophy will next be held." ... first ahead of Victorians, James Wierzbowski and Pip Pietromonaco in second and New South Wales team Martin Thompson and Bella Zanesco picking up third before the boats were once again returned to shore and sailors headed back out for race 10. The 59-year-old decided to enlist as crew on a round-the-world yacht, sailing the vessel for 15 days back from the Azores to Plymouth next month. A keen sailor in her youth, Mrs Awcock said she wanted to do something incredible to inspire other women.
" . . . Club Award - San Diego Yacht Club (Calif.) The SDYC is home to 17 one-design fleets from kiteboards to Pacific Cats, and an active PHRF and ocean racing fleets. In 2013, SDYC hosted over 15 regattas at the local, regional, national and international level. They have created several innovate programs to keep one-design racers active and integrated. Monthly One-Design Weekends are held with free entry fee for all. The California Dreamin’ Series was in its third year as a match race circuit between SDYC, St. Francis Yacht Club and Balboa Yacht Club using J22s. . . ."
• When: Thursday through Monday. Hours: 10 a.m.-6 p.m. Thursday; 10 a.m.-8 p.m. Friday through Sunday; 10 a.m.-6 p.m. Monday. • Where: Miami Beach Convention Center; Sea Isle Marina & Yachting Center; Miamarina at Bayside. • Admission: $35 Thursday (Premier Day); $20 all other show days; $85 five-day adult pass; $35 two-day adult pass; free for kids 15 and under accompanied by adult. • When: Thursday through Monday. Hours: 10 a.m.-7 p.m. Thursday through Sunday; 10 a.m.-5 p.m. Monday. • Where: Indian Creek Waterway along Collins Avenue from 41st to 52nd Streets, Miami Beach. San Diego to submit bid for America's Cup - SFGate: "....The commissioners, two of whom are sailors, spoke enthusiastically Tuesday about the prospect of hosting sailing's marquee regatta, and directed the port's staff to respond to a request for information from America's Cup officials by March 3...."
State sailing commission established. Gov. Lincoln Chafee signed an executive order establishing the Rhode Island Sailing Events Commission, a board charged with identifying and attracting more internationally recognized sailing events to the Ocean State.